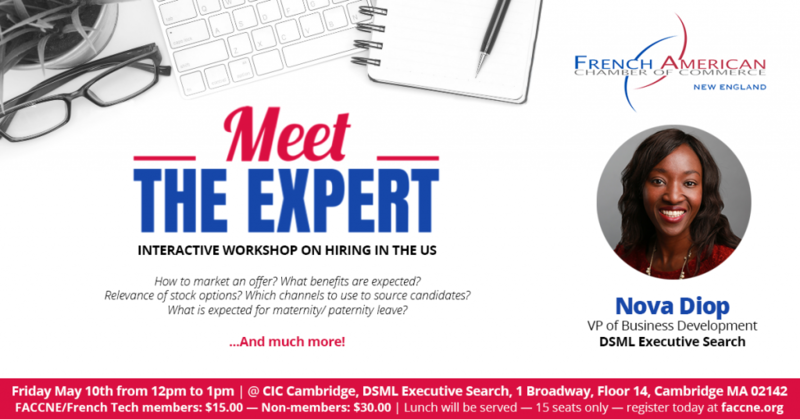 Nova Diop, VP of Business Development at DSML Executive Search, will share her expertise during an interactive workshop on hiring in the US. She will help participants understand the important concepts during the hiring process, such as how to market an offer, what benefits are expected, the relevance of stock options, which channels to use to source candidates what is expected for maternity/ paternity leave, and much more! Please send us your questions if you want them answered. Nova Diop is leading the Boston office of DSML Executive Search, and is VP of Business Development. DSML Executive Search is a retained executive search firm, focused in helping international companies to build their senior leadership and management teams in the US. Nova has full cycle executive recruiting experience in retained search. She has a proven track record in acquiring clients and sourcing candidates for difficult to fill positions at both the executive and middle management level. She is focused on advising clients and recruiting executive level candidates in Life Science, Consumer and Industrial sectors. Nova graduated from Brandeis University International Business School, with an MBA in International Business. She also received a B.A. in Hospitality Business Management from University College Birmingham in UK, and a university degree in technology from Montpelier University, France. Nova has lived on three continents in five countries and has worked extensively with companies in over 20 countries.